Less than 48 hours after learning he had been traded from Cleveland to Utah, Kyle Korver stepped on the floor on Friday for the first time as a Jazzman in 2018, and immediately hit a three just 12 seconds after entering the game. That Korver was traded wasn’t a huge shock to him. Given the Cavaliers were no longer a contending franchise after the departure of LeBron James, Cavaliers general manager Koby Altman had been upfront with Korver, letting him know it was very likely he was going to be traded to the highest bidder at some point before the trade deadline. But to Korver, the destination was important to him. So he submitted a list of teams to Altman, teams where Korver had family or friends waiting, or places he was comfortable with moving. One of those teams was the Jazz; as he said when he was a free agent in 2013, “I have a lot of respect for the organization, and it’s just a great place to live life and play basketball.” Altman, though, was under no obligation to trade Korver to someone on his list of teams, but Korver is glad he did. Meanwhile, Jazz general manager Dennis Lindsey broke the news to the other player involved in the trade — swingman Alec Burks — personally, as he always makes it a priority to do. The Jazz were in Brooklyn, and Burks was already at the arena. Lindsey had a phone already connected with Burks' agent after the conversation, so they could talk about what his opportunity would look like in a Cavaliers uniform. Next, his agent connected him with Cavaliers management. Later, Burks entered the Jazz’s locker room and told his teammates — leaving them in a state of shock, according to multiple players. From there, a dizzying maze of logistics had to be considered. First, there was the travel, which needed to be booked immediately to move the players as quickly as possible. Burks, for example, left the Barclays Center just an hour after learning he had been traded — a half hour before he was slated to play against the Nets — to catch a flight to Cleveland. Since the Jazz planned to head directly to the airport after the game, Burks had already packed his bags. For Korver, things were even more complicated: He wanted to return to Cleveland to break the news to his family personally. Korver has a wife, Juliet, and three kids: a daughter (age 6), and two boys (ages four and two). By the time he arrived in Cleveland, the kids were already asleep. After a night of planning, talking and not much sleeping, Korver told his kids the news when they woke up the next morning. 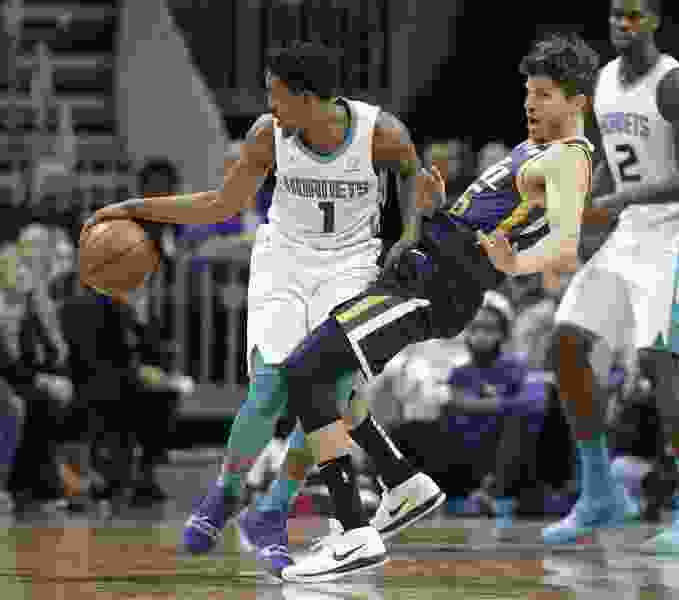 Korver then immediately boarded a flight that the Jazz had booked for him to fly to Charlotte, N.C. Korver arrived in Charlotte at about 4 p.m. Thursday. While he was in the air, the Jazz and Cavaliers completed the trade call with the NBA, allowing both teams to send out the press release with the news. That didn’t mean the trade was completed, though. Both players still had to undergo physicals, and Korver’s took a couple of hours. After a whirlwind day, he was in the Ritz-Carlton in Charlotte by 7:30 p.m with the rest of his new team. The next morning, Jazz executives obtained the “trade certificate” from the league that permitted Korver to participate in the team’s shootaround at 11 a.m.
Klauke also needed to know which shoes Korver was going to wear, so he contacted Korver and got his shoe model, size, and color preferences. Korver wears Nike, which immediately shipped the favorite shoe and color Korver preferred, and that matched his new team’s colors. All of the team gear that the Jazz use, from travel suits to extra t-shirts, was also shipped to the Jazz in Charlotte. All of the above got Korver in a Jazz uniform and eligible to play. But there were so many other items to consider, which the Jazz’s front office helped out with behind the scenes. Linda Luchetti, Jazz VP of basketball operations, directed the onboarding process for new players from a off-court perspective. Among other things, Luchetti had a buffet of housing options for Korver and his family around Salt Lake City that they could move into on a moment’s notice. Luchetti also had a small list of public and private schooling options set up for Korver and his family to choose from, along with the plusses and minuses of each. Korver’s family will likely stay in Cleveland through December while their daughter finishes up her first semester of kindergarten, then move to SLC. In Charlotte, Korver had to take his new Jazz headshot, used for Jazz promotional materials, in-arena graphics, and on the Jazz broadcast. All of these are created by separate Jazz marketing and broadcast employees. His jersey wasn’t yet completed, but luckily, the headshots are just taken from the shoulders up. Korver, surprised by the headshot request, hadn’t yet quite done his hair to his liking. Media had to be handled, too. The Jazz first set Korver up an interview with Jazz broadcast TV, then another with the team website, then another with the assembled media at shootaround. Name tags were created for Korver’s locker at the Zions Bank Basketball Center and at Vivint Smart Home Arena. On Friday, Korver’s locker tag was simpler: his name and number written on some athletic tape. In the midst of all of that, Korver had to learn everything about his new team on the court. First, there were the plays. The Jazz carry around their current playbook on iPads for situations like this, but they know that it’s tough to expect Korver to learn all of it right away, especially with everything else going on. And Korver also had to learn the team’s language, on both offense and defense. “I had Quin for a year in Atlanta, and really respect his mind for the game,” Korver said. “He’s created all of this terminology that’s unique, as is he,” he smiled. Finally, there was learning the personnel he would be playing with: their tendencies, where they want the ball, how they fit as pieces in the offense and defense. Overall, Korver says he knew what was going on about “25 percent” of the time during Friday night’s win over the Hornets. And despite all of what he’d been through in the the previous 48 hours, Korver’s 14 points and 5-7 shooting was a key part in the victory. After that, Korver took his baggage and boarded the Jazz’s charter flight to Miami, arriving after midnight in Florida, following a day he thought he’d be in Boston, where the Cavaliers played Friday. “The NBA is crazy, man,” he said.